Published on 13 July 2008. It’s the third week of this series of book reviews, and given that the two featured so far have featured uncontained vitriol towards the Satan of modern literature, Dan Brown, it seems only right that I should “get it out of my system” by doing a whole review of one of his “novels”. And so, without further ado, this week’s selecion has to be Digital Fortress. 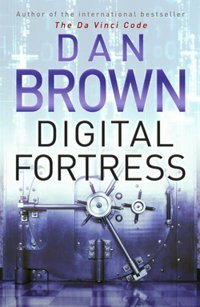 As with all of Dan Brown’s “works”, Digital Fortress is by no means deep, considered, or erudite. It’s a shallow page-turner riddled with predictability. The final thirty pages of Digital Fortress were, perhaps, the worst of Dan Brown’s “writing” I’ve had the misfortune to experience: The solution to the book’s central conundrum was glaringly obvious, and yet apparently the most accomplished cryptographers in the world were unable to work it out: Despite having earlier demonstrated an intimate knowledge of other obscure chemicals, they are unable to recall basic facts about the most famous of all elements. In many ways, that’s the least of the plot holes: Why on earth would one build a glass-roofed dome to house a top secret military computer? Given the clear risk of dangerous chemicals sending this top secret computer into meltdown at any moment, why not have emergency exits in the highly secure glass dome? Why secure offices in a department housing the most accomplished cryptographers using security barriers protected with passwords, rather than, say, keys? Why, in a military organisation, is there so much unpunished insubordination? Why, in a piece based around NSA cryptography, does Mr Brown still feel the need to shoehorn in a scene set in a Catholic Church? It’s all a little bit bizarre. There are so many gaping plot holes, I often wondered if I was about to plunge into one never to be seen again. Mr Brown even throws some nonsensical romances into the mix, apparently attempting to build interest into which of his flimsy 2D characters would fall in love with which other. Without wishing to give away too much, the whole affair is verging on freakishly incestuous, yet that fact is utterly ignored. Yet, my most major problem with this “story” is that it is genuinely gripping: It’s difficult to stop reading, because it is so utterly trashily terrible. It’s impossible to resist the lure of reading on to find out when characters are finally going to catch up with the bleedin’ obvious, and to enjoy skirting round the edges of another humorously improbable plot hole. And so bizarrely, frustratingly, and somewhat disappointingly, I find it impossible not to recommend this “book” – at least on some level. Whilst it’s self-evidently one of the most terrible “works” of modern “literature” my eyes have ever wasted their time scanning, it was actually – secretly – quite entertaining. Perhaps, in the end, provision of entertainment is the most important function of any novel. It’s just that I find it very hard to truly enjoy any book whose central storyline is rubbish, even if it is gripping. But maybe I’m elitist. Hey-ho, I guess the best I can say is that you really need to read the thing to know whether or not you’ll like it – which, I guess, is true of any book, and leaves you no better informed than you were at the start of this review… Ain’t blogging great? This review was originally posted here on sjhoward.co.uk in April 2005, and has been re-versioned for the ‘Summer Books’ series of reviews published on sjhoward.co.uk and Gazette Live. This 1,347th post was filed under: Summer Books, Books, Dan Brown, Gazette Columns. Comment posted at 20:37 on 14th July 2008. To be fair though, it’s nowhere near as awful as Angels and Demons. That twisted science to create a truly ludicrous story involving a footnote in the Vatican’s archives, a series of convenient inconveniences, and some ridiculous story about antimatter being carried in a small container to the Vatican to be used as a bomb. But even that wasn’t as awful as The Da Vinci Code – the most depressingly boring book I’ve ever read. And I just can’t get how that boring professor always ends up sleeping with a beautiful girl at the end of each book about him. Comment posted at 23:35 on 14th July 2008. I don’t think I’d call any of Brown’s books boring – just crap. As for Angels and Demons, I found that vaguely amusing….